Good To Begin Well, Better To End Well: Numbers as Promised! The other day, I ran a word count check on "eyes," which seems to consistently be the most overused word in all of my manuscripts to date. The result? 457 eyes. To put this in perspective, let me offer you some other numbers. My book is 99,616 words and 335 double spaced pages (Times New Roman, 12pt Font). This means there are, on average, 1.4 pairs of eyes per page in my manuscript. The word "eyes" makes up about .04% of my novel. That's less than half a percent, and when I look at it like that, I feel a little bit better. Still! I felt it would be prudent to take out some of those extra eyeballs, so as I continued my revisions, I started replacing them as I came upon them in the text. I'm happy to report that I brought the number down to 433-- and I'm not quite half way through the book. Obviously there will need to be a second cutting, later, but I'll take what I can get. The word just above eyes in frequency is "The" with a capital T (483), and "but" has tied eyes for usage. I was surprised there wasn't more "but" until I realized that there's an additional tally of 290 uses of the word "But." Maybe I should be more concerned about B(b)ut. In contrast, I use the names of my primary characters Eve (388), Adam (296), Thor (259), Reu (209), and Garrit (195) far less. In case you're wondering, the word "back" comes in at 374, with "could," "them," and "me," buffering it against Eve. There will be some search and replace in the future for "back." The top scoring word? "the" lowercase, with over 4000 uses. 4% of my manuscript. Yowza. Those articles really take up a lot of word count real estate. By the way, if you don't see me around the blogosphere in the next couple of days, it's because I've banned myself from the internet to finish revising 24 chapters in less than a week. If major progress does not get made, I may have to skip my Friday blogpost--so savor the statistics! And also, feel free to check out your own! What's your "eyes" equivalent? Whoa! I haven't run any numbers on Hatshepsut like that. I do know I had a whole lot of "justs" a couple nights ago. I can thank Gary Corby for making me think to check that one. I'll be absent starting Friday too- good luck with your revisions! What a great way to take a new look at your work! How, exactly, did you do that? Stephanie: I didn't notice "just" in my numbers, at least not up at the top with the crazy scorers, but it'd be prudent of me to take a look. Christi: Wordle has a function which counts all the instances of single words and puts them into a table for you. It's under the "language" menu after you've made your word cloud. You wouldn't be able to tell how many times you used "triumphant smile" but you would be able to tell how many times you used "triumphant" and "smile"
i love wordle for this. You and I have a lot of favorite words in common. I always have too many eyes, hands, just, head, and back. All those body parts all over the place, lol. Good luck in your revisions! Roni: my people just keep looking BACK at things. I expect they have lots of cricks in their necks. OH man--I'm scared to do a search of words in my WIP. I'd probably end up with a scary number of "thats". Crap, now I have to go check. haha! Great post! Wordle rocks my face off. Sometimes it's gotta be done, Courtney! :) Good luck! 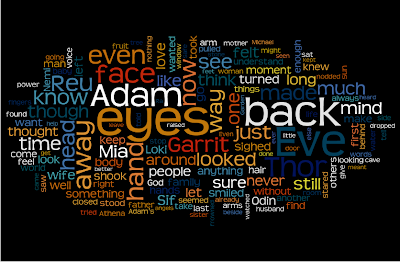 Amber: I actually ran wordle on my WIP that I'm revising :) I'm not sure my blog has made it into hefty novel length yet. I love how handy Wordle is! And it's fun. Like Stephanie, I'm a "just" person. As soon as I finish a chapter draft I immediately cull them all out, because I just know they'll be there. Good luck with those revisions! 24 chapters in a week isn't ambitious, it's a marathon.